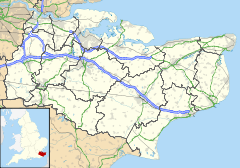 For Nettlestead in Suffolk, see Nettlestead, Suffolk. Nettlestead is a village and civil parish on the road south-west of, and part of the borough of Maidstone. The parish includes Nettlestead Green and part of Seven Mile Lane. More than 800 people live in the parish. The parish church of St Mary the Virgin has links with William the Conqueror's half brother, Odo. According to the reference quoted below, 'it is said that Nettlestead church owes its enormous stained glass windows to a 15th-century Agincourt veteran who came back from France very impressed with what had already been done with stained glass decoration for churches there. The man was Reginald de Pympe, and his son, John, added more stained glass later in the same century. The de Pympes made quite an impression upon Nettlestead in their day. Reginald moved into Nettlestead Place, which he rebuilt at about the same time as he had the church rebuilt and embellished with the new glass. Nettlestead Green is a separate village lying two miles farther south. Both villages are close to the River Medway. ^ "History of the village of Nettlestead". Nettlestead Parish Council. Kent County Council. Archived from the original on 4 March 2016. Retrieved 17 October 2015. This page was last edited on 18 February 2018, at 17:06 (UTC).